Attention! There is 12 different versions of this smartphone. Differences include the key elements of the technical specification and therefore each version can be found in the catalogue. 1.8-2 GB end-user memory. The list of different names: 4013X, 4013M, 4003A, 4014X, 4050X, 4050A, 4013D, 4013E, 4013K, 4013J, 4050D, 4050J. 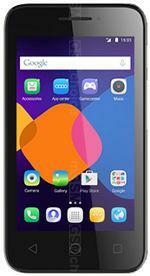 Alcatel One Touch provides divergent data about operating systems. According to them, any OS can be installed in any smartphone version (Android 4.4 KitKat, Firefox 2.0, Windows 8.1). Gesture support.